Find Success In Less Time With Action Movie Workouts! Scroll down to pick the actor that you most want to look like and cater your training to that program. These cutting edge training principles and techniques can transform each one of you into your own 'super hero'. Every year millions of fans stand in line, sometimes for hours, to catch a glimpse of their favorite Hollywood star. These actors and actresses therefore have a huge responsibility to bring forth the absolutely best physique for the role they are meant to play. Actors such as Will Smith, Brad Pitt, Gerald Butler, Jennifer Garner, and Robert Downey Jr. all have had to create a screen worthy physique in a very short amount of time. These individuals realize that millions of fans will be evaluating them and therefore perform precise workout programs to produce such screen-worthy physiques. Few if any of these celebrities would win a bodybuilding competition but still have millions of individuals wishing they could, just once, have their physique. The fact is that while you might not be able to win the next Olympia, with sound training and consistency, ALL of you can have more muscular arms, thinner waists and defined abs. Hypothetically speaking, the actors in the movies below could follow these programs to transform their bodies into screen-ready form. I guarantee that the training programs, if followed, will bring each one of you to a level you have yet to see. Scroll down and you can pick the actor that you most want to "look like" and cater your training to that program. These cutting edge training principles and techniques can transform each one of you into your own "super hero". 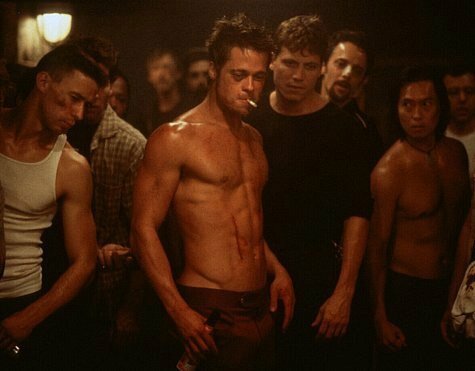 So, you want the physique of Brad Pitt in Fight Club. To accomplish this first we must realize what we are trying to do. No matter what program you train with, you MUST HAVE A GOAL IN MIND. Brad Pitt knew he must have excellent endurance and a very lean physique. This would lead many of you to believe that very high reps and low weights are the key... WRONG! In fact, this is the biggest mistake many trainees make in their quest for a lean physique. Their fears are they may grow "too muscular" or not be able to turn their head at a street crossing. Brad Pitt In "Fight Club". © 1999 20th Century Fox. Ladies and gentleman, getting large and muscular is just plain hard. It takes years and years to achieve this type of muscularity and it is often impossible without chemical enhancement. Plus, without weight training, be it male or female, JUST losing weight will simply make you a smaller version of your previous self. To be a natural bodybuilder will do nothing but make you lean and eye appealing. So don't worry and LIFT! We can all drop body fat and slowly add lean muscle that will give us all a Fight Club worth physique! Monday, Wednesday and Friday Workout: Do This 3 Times! Dumbbell Incline Press: 3 x 6,10,15 Superset with Push-ups to failure on last set: Rest 1 min between sets. After last set of 15, immediately grab Jump Rope and perform 1 minute of jumps. Even if you trip-up, keep going. The point is to get the heart rate up and keep moving. Rest 1 minute. Triceps Rope Push-downs Superset with Overhead Rope Extensions: 3 x 10/10 Rest 1 min between sets. Then immediately after last superset grab Jump Rope and perform 1 minute of jumps. Even if you trip-up, keep going. The point is to get the heart rate up and keep moving. Rest 1 minute. Take, for example, a 90 lb DB and do 6 reps with right arm, put down and IMMEDIATELY pick up 30% less weight, say 60 lbs and do 8 reps, then reduce by 30% more and rep out until failure. Repeat with left arm. Then immediately grab Jump Rope after last set of exercise and perform 1 minute of jumps. Even if you trip-up, keep going. The point is to get the heart-rate up and keep moving. Rest 1 minute. Shoulders Press 3 x 8 superset lateral raises after each set. After each upper body weight workout do 20 minutes on bike/treadmill or elliptical. Click Here For A Printable Log Of Monday, Wednesday & Friday. Lunges: across gym, on sidewalk or football field. Do 50 with each leg. Do 30 minutes of cardio, low intensity of your choice (walk on treadmill, bike, elliptical) after your leg training. Click Here For A Printable Log Of Tuesday & Thursday. This workout should last 6 weeks and then like all workouts... it's time to switch it up! Please make sue you take in enough protein and carbs post-workout! Get your sleep and push yourself to a place you didn't think you could go. The results are worth it. 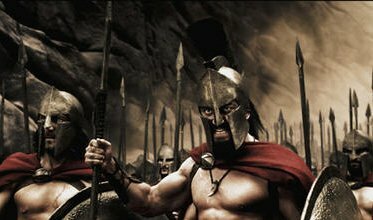 Ahhhhh... 300. What a movie! Gerald Butler, h#ll, his entire army could have taken turns on the cover of any major fitness magazine. How could they possibly do that? Well, I won't say it will be easy, but it can be done. If your goal is to have a muscular physique with body fat around 10-12% then this is your workout. Cardio will not be as severe as the Fight Club Workout but here we are trying to build more mass but still maintain a fairly lean physique. After all, we have to carry swords and shields and... well... you get the point! You WILL force the central nervous system to accept the weight you choose as the new standard. This is where many make a mistake and only do one set with a heavy weight. Won't work. Only if the central nervous system thinks, "Good night man... this guy means business boys, he isn't just lifting that 100 lb DB once this week, he's trying time and time again, better call in reinforcements!" The nervous system will thus summon more motor units, more weight will go up, and more muscle will be stimulated to grow. That is the basis of set 1 and we will ATTEMPT to do 5 sets of reps with the same weight. If you can't get a total of 15 reps then the weight is too much (i.e. 5,2,2,1,1) or if you get more than 25 it is too light (i.e. 7,7,8,5,5). Do 5x5. 2-3 minutes of rest between. Now we will increase the reps to the 8-10 range. Since we slapped the muscle in the face right of the bat, it is ready to rock! These 3 sets and reps in the 8-10 range will burn and REALLY pump your muscles up. More blood with flow into them, bringing with it nutrients and a growth cascade. Again do 3 x 8-10 with 1 minute of rest between. My friend and trainer extraordinaire Eric Broser taught me all about this demon. Now we are going to punish and DEMAND that the muscles grow. This will include a giant set to finish the drill. It will make sure each and every fiber is hit and stimulated to grow. We will do three different exercises for 10-12 reps with the last rep being one you can barely get. Zero rest between exercise changes... I am sorry. 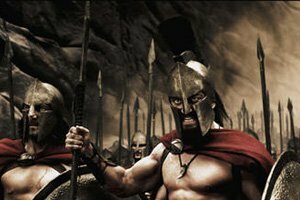 Vincent Regan And Gerard Butler In "300." Set 3: 1 x 3 exercises in 10-12 range. Zero rest. Cardio: 6 days per week for 20 minutes after lifting and on non lifting days 30 minutes first thing in the morning after consuming BCAA or 1 scoop whey. Click Here For A Printable Log Of Monday: Chest, Triceps & Shoulders. Click Here For A Printable Log Of Wednesday: Legs. Click Here For A Printable Log Of Friday: Middle Back & Biceps. 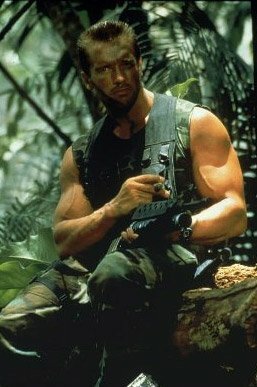 How can you not love the movie Predator? After all, it has perhaps the most legendary bodybuilder of all time and tons of action to boot. Not only was Arnold starring in Predator but also Jesse "The Body" Ventura and Carl Weathers. No matter which one of these action stars' physiques you were most impressed with I can promise you they all were founded on hard work in the trenches. These include compound lifts and intense workouts. Arnold was notorious for performing many, many sets on his way to one of the most legendary physiques in history. I have always believed that one can train extremely intensely with few sets or with high volume, meaning a very large number of sets. Arnold seemed to do both! So, lets create a workout that mirrored what Arnold might have done to prepare for a shown down in the jungle. Are you ready? © 1987 Twentieth Century Fox. We will train Monday through Friday with cardio on Saturday and Sunday only. This will ensure you have ample time to rest and recover. Each body part will get hit with 3 exercises and a total of 15 sets. One body part hit per day and 1-2 minutes of rest between sets. Take in adequate protein and sufficient carbohydrates to initiate repair. Try to get at least 15 g of BCAA and glutamine per day. Sleep at least 8 hours per night and MAKE SURE to consume a quality casein protein blend with 1 tbsp natural peanut butter before bed. Drink at least 1 gallon of water per day. Take in 500 g Vitamin C 2x /day. Click Here For A Printable Log Of Tuesday: Quads, Hamstrings & Calves. Click Here For A Printable Log Of Wednesday: Back. Click Here For A Printable Log Of Thursday: Shoulders. Click Here For A Printable Log Of Friday: Arms. There you have it, the perfect plan to add mass and shock your body into growing. This again is an example of a high volume workout and to do more than this or to continue with this workout past 4 weeks will lead to overtraining and/or injury. Train hard, keep your body guessing and treat each workout like it's your last. That's what Arnold did and I think he had some success.